Some of this information is entered by the RIPE NCC, such as the IP address allocations and AS Number assignments that were given to a certain resource holder. Other information is entered by resource holders themselves, such as customer assignments, reverse DNS, routing and contact information. People who want to query for this information have several options available to them, varying from a web interface to a command line tool, as well as a RESTful API. There are several ways in which you can influence the scope of your search. For example, you can query for a specific record identifier, do a free-text search, or perform a query that includes results from whois databases run by other Regional Internet Registries. This document will outline which query method will give you the best results. The RIPE Database stores all information in records known as objects. These are blocks of text in a standard notation defined in the Routing Policy Specification Language (RPSL). An object has multiple fields, called attributes or keys, that each have a value. Here is an example of a person object, which describes an individual who has a certain responsibility, such as administrative or technical contact. The formatted object in this example is created according to a template. There is a specific template for each object. Users have to stick to the template, as well as the syntax rules for each value, when creating an object in the RIPE Database. Here is the template for the person object. The primary key is a unique identifier within a set of objects of the same type. In the case of the person object, the "nic-hdl:" is the only attribute you can be sure won't appear in any other person object (unlike the "person:" attribute with the person's name). Thus, in this example, searching for "Axel Pawlik" might give you multiple results, but searching for "AP110-RIPE" will give you only one. The lookup key is simply an attribute that is indexed, meaning that you can search for it. An inverse key allows you to search for all objects that reference that particular attribute value, which means you can for example do a query for 'all objects that have this specific "mnt-by:" value'. You can find more more details and examples in the Advanced Queries section. The primary, lookup and inverse key are paramount to keep in mind when querying the RIPE Database, because only these attributes are searchable. This means that when looking for a specific person object, you can find it by querying for the value in the "person:", "email:" or "nic-hdl:" attribute, but not by the looking for the "address:" or "phone:" value. Lastly, you can only do inverse queries on some attributes. Please note that when searching for resources such as an IP address block or AS Number, contact information from related objects will automatically be returned as well. You can only query for a limited amount of personal information every day. After reaching that limit, you will be blocked from making further queries. To disable automatic queries for personal information, please use the "-r" flag, as explained in the Advanced Queries section. If you are looking for a specific piece of information and you don't know one of the values required to find what you are looking for, you may consider using the Full Text Search instead of doing a standard query. Full Text Search treats the entire database as a flat text file and allows you to search for anything. The search is done on object text without regard for any relationships. As such, results may be very unstructured, but it can provide a good starting point for more specific standard queries later on. 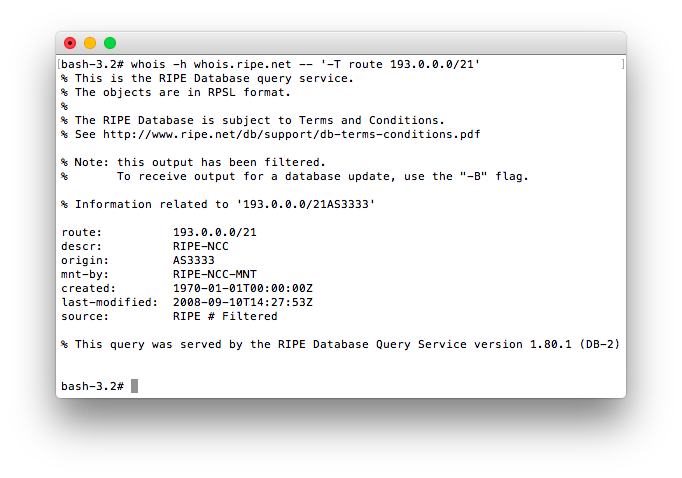 Keep in mind that Full Text Search is only available on the RIPE NCC website and not in other methods to query the RIPE Database. For most use cases, the web interface provides a straightforward way to perform a RIPE Database query. With a simple check mark or radio button, you can easily broaden your search to include other databases, or narrow it down to only query for certain object types. If needed, you can switch to Full Text Search with a single click. 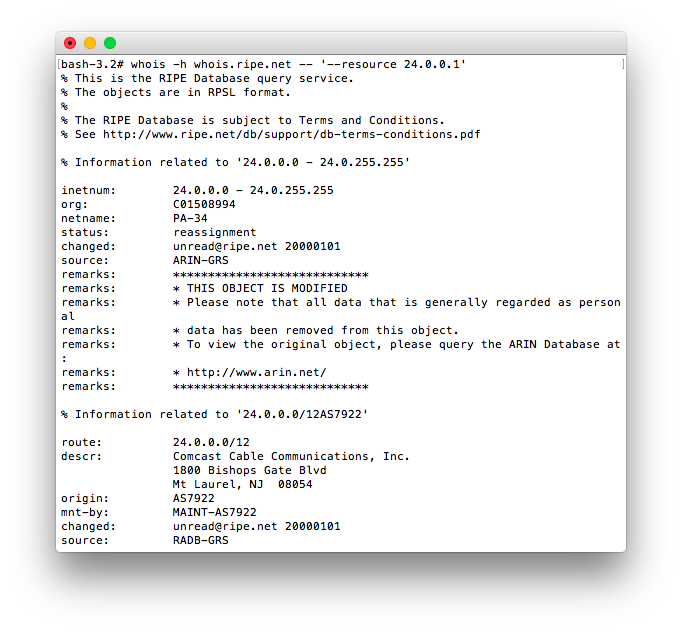 For users who prefer to query from the command line, you can open a telnet session to whois.ripe.net on port 43 and perform your query. After the result is returned the connection is automatically closed, unless you tell the RIPE Database to keep it open by using the "-k" flag. Alternatively, most UNIX-like operating systems are shipped with a whois client. These often add additional functionality and flexibility, but should be used with care. 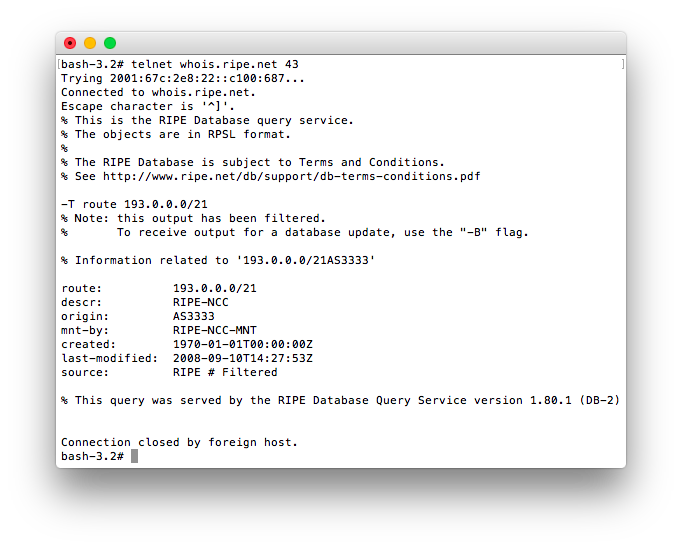 This is because the whois client itself accepts flags, but so does the RIPE Database. In addition, not every flag in every whois client implementation has the same meaning, for example in Linux versus BSD-based distributions. 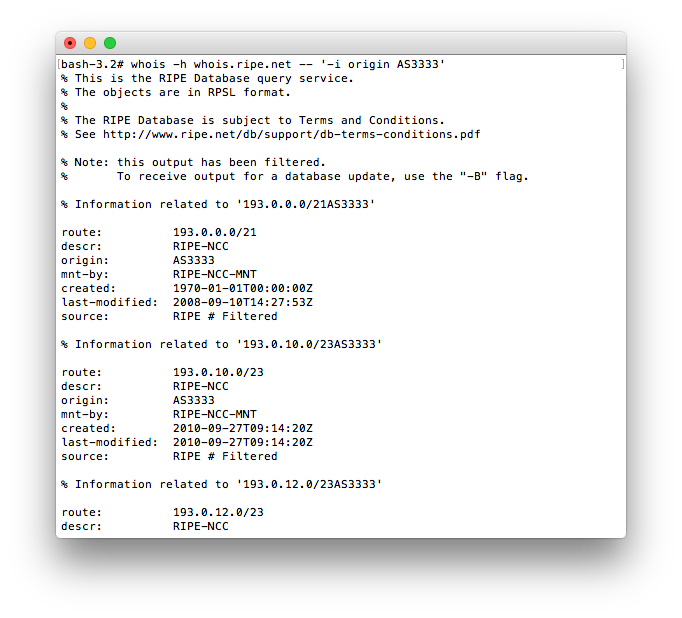 To ensure proper flag usage, refer to the man pages of your whois client. 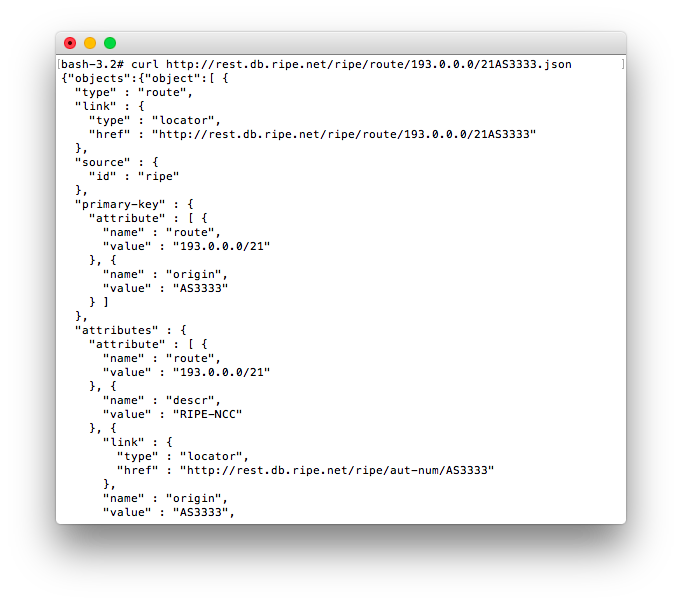 The RIPE Database also offers a RESTful API, which returns results in XML or JSON format. Your client should specify the desired response format using the Accept: header in the HTTP request or append an extension of .xml or .json to the request URL. The server will return a response in the appropriate format for that given extension. If the request fails, any error messages will be returned in the response body. The full documentation for the RESTful API is available on Github. The RIPE Database only contains information related to IP addresses and ASNs that are managed by the RIPE NCC. So if you are querying for any random IP address that you would like more information on, you may get a specific result if the range is managed by the RIPE NCC, or you may find a generic placeholder that says the IP address belongs to a range managed by another Regional Internet Registry (RIR). Because the RIPE NCC is bound by Dutch and European data privacy laws, we are obliged to remove all personal data received from other databases. This is either removed at the source or stripped out and deleted during the transformation process. The RIPE NCC does not store any personal data from other registries. Where necessary, we create and reference dummy objects to keep data integrity intact. Wrapping unrecognised attributes with "remarks"
To use GRS from the web interface, select the appropriate radio button below the search box. When using telnet or the whois command line client, add the "--resource" flag to your query to query only the dummified GRS databases, or the "-a" flag to query all available databases, i.e. GRS sources and the original RIPE Database combined. Using the API, you can specify one or multiple GRS source names as parameters, e.g. "source=arin-grs" or "source=arin-grs&source=apnic-grs". For more information, please refer to the documentation on Github. By default, when you perform a query all object types and lookup keys are searched for. In many cases you will want to look for more specific information, which can be achieved by selecting the appropriate check box or radio button in the web interface, or by adding a specific flag to the search query. When doing IP address lookups, you may want to see ranges that are more or less specific than your query to get a better understanding of the relationship between the ranges. Here is an overview of the most common flags. The full list can be found in the Query Reference Manual. -l First level less specific query. It shows one level above the range your are querying, for example showing the allocation that a certain assignment is part of. -L All levels less specific query. This option returns all ranges that include the IP address or range in your query. Use this option to view any upstream IP address blocks associated with the query range. Viewing the upstream IP address range can be useful for network troubleshooting. -m First level more specific query. It shows one level below the range your are querying, for example showing all assignments that were made under a certain allocation. -M All levels more specific query. This option returns all more specific address ranges within the boundaries of the IP address range specified in the query. Use this option to view all suballocations and assignments made under an allocation. Use this option with care, as for example all levels more specific under a /8 will return so many results that it might leave you blocked from accessing the RIPE Database. Inverse queries request all objects to be returned that reference the specified query argument in the attribute(s) specified in the query flag arguments. For example, it will allow you to find all objects in which a certain person is the administrative contact (admin-c), or it will allow you to find all route objects in which a certain ASN is referenced as the "origin:" attribute. Here is an overview of the most common inverse query flags. The full list can be found in the Query Reference Manual. -i admin-c NIC-handle or person Objects with a matching "admin-c:" attribute. -i tech-c NIC-handle or person Objects with a matching "tech-c:" attribute. -i person NIC-handle or person Objects with matching "admin-c:", "tech-c:" or "zone-c:" attributes. -i mnt-by Maintainer Objects with a matching "mnt-by:" attribute. -i mnt-lower Maintainer Objects with a matching "mnt-lower:" attribute. -i mnt-nfy e-mail mntner objects with a matching "mnt-nfy:" attribute. -i mnt-routes Maintainer aut-num, inetnum and route objects with a matching "mnt-routes:" attribute. -i origin AS number route and route6 objects with a matching "origin:" attribute. In the web interface, there is a separate tab that allows you to do inverse queries. Here is an example of the notation in the command line interface. Requests a persistent connection. A client may issue multiple queries on the same connection. The server will not close the connection until it receives a -k without an argument (after the first one). -r Switch off recursion. By default, the RIPE Database will return contact information that is associated with the objects returned in the query. With this flag you turn this functionality off. This may be important if you are doing a large amount of queries, as you can only retrieve a limited number of personal information from the RIPE Database every day. If you exceed this limit, you will be blocked. -B Return the full object instead of the filtered output, which by default hides email addresses. The -B flag is required if you are going to copy the object to make edits to it, in order to resubmit it later. For a full overview of all query types and flags, please refer to the Query Reference Manual.